I've been looking for a concealer for a while now and I kept going back to Boots to grab the famous Collection 2000 Lasting Perfection Concealer but they either never had my colour or the ones that they had had, had all been opened. 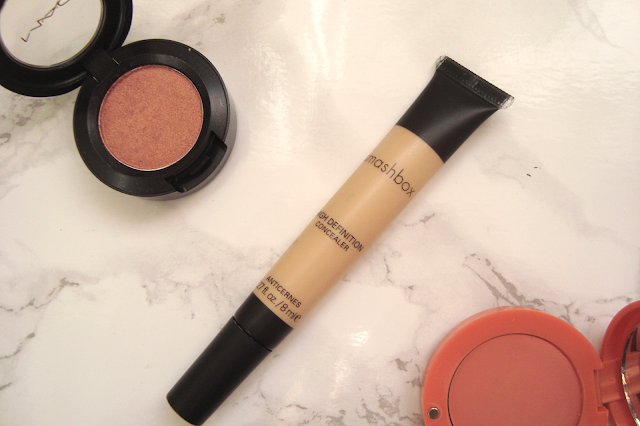 I eventually gave up and on a recent trip to the Cosmetic Company, I purchased the Smashbox's High Definition Concealer in Fair/Light. I didn't search for reviews on this product before I bought it, I bought it on a whimmy whim. I picked up a tester and squeezed a bit onto my hand and it was light, creamy, pigmented and more importantly, my colour, so I took one to the till and happily handed over the money before going home, shoving it in a cupboard and there it stayed for quite a while. I suppose this is down to the fact that I don't usually need concealer so don't usually use it until one day I noticed I had dark circles under my eyes so I decided to drag it out of the dark depths on my bedroom and give it a try. 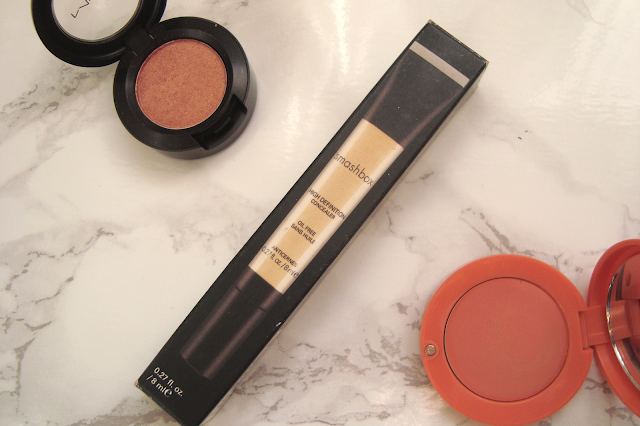 "Conceal imperfections and dark circles with this weightless, good-for-your-skin formula that provides buildable coverage." So I'm expecting great things! Except.. Either I bought a dud one or the concealer I tested in the shop is a completely different formula to the one I bought. The formula of the concealer I tested in the shop was light, creamy and worked into the skin like a dream.. Have a look at the photo below and I'll tell you how this one works. The formula of the concealer I bought was thin, watery, and took a good deal of rubbing for it to soak into the skin. Now I know somewhere on the packaging it says something about giving it a gentle shake for everything in the tube to come together but no amount of shaking will bring this concealer together. When I squeeze a little out of the tube it comes out as watery substance first then I'll get a small clump of how the concealer should be - not ideal. Onto the packaging which I don't usually talk about. The concealer comes in a little 8ml tube with a rather large hole where once you squeeze the tube, the concealer should come out of. It does that job very well, a little too well, perhaps. If you only wanted to use a small amount of this concealer you'd have to make sure you didn't squeeze the tube too much otherwise half of the tube will pour out and you'll have £6 worth of concealer all over the back of your hand - again, not ideal. And finally, the concealer itself. Even though the formula is a little odd, the concealer does seem to work rather well. As I'm convinced I have a dud product, it does take a little bit of rubbing under the eyes to make it fully sink in and if you don't rub it in enough it can look a little cakey like in the photo above so it's better to apply using a concealer brush. It completely covered up the dark circles under my eyes and made my skintone look completely even which is all what a concealer is about. It lasts all day too and doesn't budge! Even though the formula is rather watery and, dare I say it, odd, I still think it does the job well and completely covers up blemishes. I do believe I have a dud product so maybe I'll have to buy another and find out! 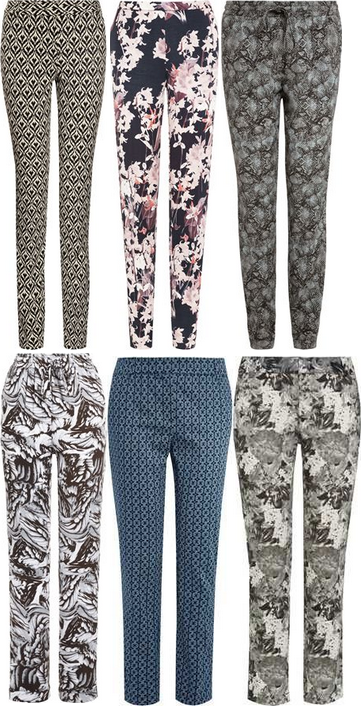 Recently I've been seeing lots of girls wearing printed trousers. 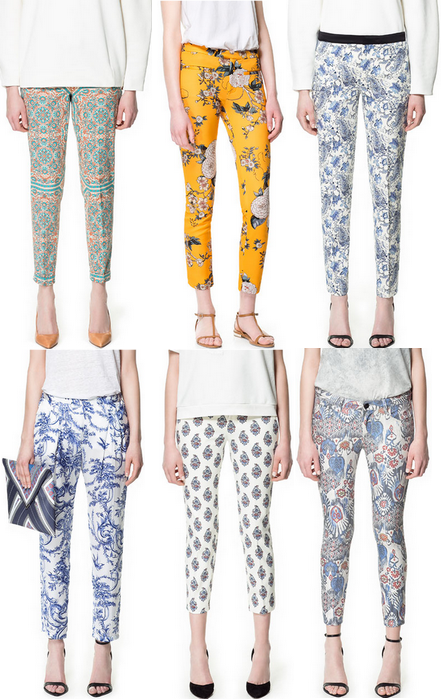 Whilst staring at a girl wearing pale grey paisley printed trousers, I immediately thought of printed harem pants, (remember when they were all the rage?) 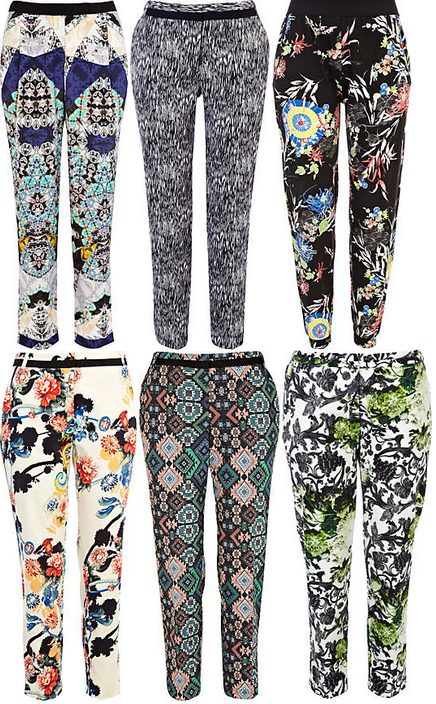 shuddered, then thought of skinny printed trousers.. I found myself wondering "I wonder what they'd look like on me?" 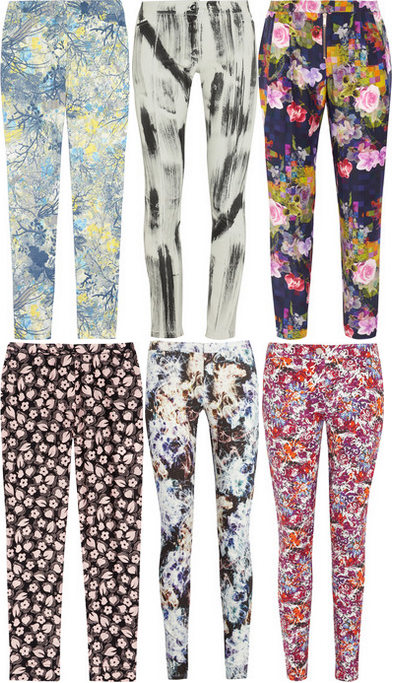 which then made me think "what would I wear them with?" "what shoes would I wear?" 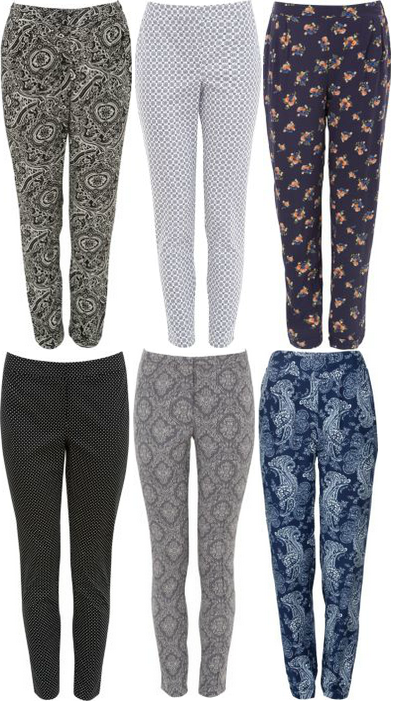 So I reverted to tumblr where I saw that girls wore them with plain tees, blazers, strappy shoes.. Well of course, that night I lay in bed and dreamt about them, so much so that I now need a pair in my wardrobe, to wear/stare at. 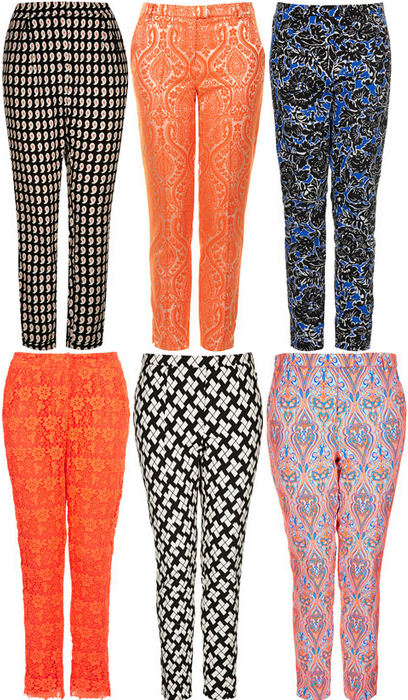 And if money were no object..
Will you be buying any printed trousers this year? I think I may be. Recently I've noticed that my hands have become horribly dry. They were so dry the other day that it was like walking around with sandpaper as skin. So, I raided my mum's bedroom and came across her little selection of hand creams. First I tried one from Victoria's Secret which smelt amazing but was a tad too greasy for my liking. Then I tried a cheapy one from ASDA which did the job but I had to wait half an hour after using it before I could touch anything as it didn't soak in very well. Finally I tried a foreign hand cream from Turkey which smelt so awful that I daren't rub it anywhere. In fact I chucked it in the bin but shh. So I took myself off to Boots and traipsed up and down the aisles looking at all of the hand creams. There were hundreds. (Probably. Though I could be exaggerating.) How did I know which one to choose? They all claimed different things, all came in different sizes with different prices.....So I chose the pretty one. 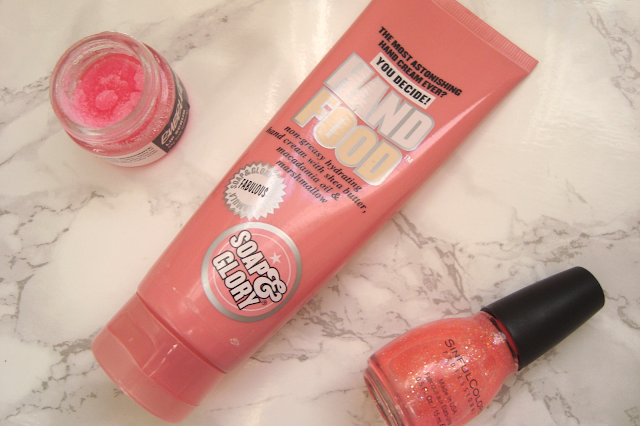 Soap and Glory's Hand Food. Before I start with the review I have to say that this hand cream comes in two different sizes. There is 50ml for £2.50 or 125ml for £5.00. Obviously the math GCSE comes in to play and 125ml's for £5.00 is the better deal but for carrying around in your handbag the 50ml is better. I panicked and bought the smaller version as I didn't know which one to buy but next time 125ml's of this badboy is coming home with me! Anyway, onto the product itself. The packaging calls it an "anti greasy hand cream" and I completely agree. It's thick, creamy and dries into the skin within moments. Once it's absorbed I can get on with whatever I was doing again - no waiting half an hour for the grease to soak in to my skin. It leaves my hands feeling super soft, completely moisturised, like I have brand new skin and lasts practically all day. I don't find that I have to apply it numerous times a day like the previous hand creams I've tried and you don't need to use much either as it's so thick and creamy a little goes a long way. Another great thing about this product is the smell. All of Soap and Glory's products smell amazing (Supercat Eyeliner not included) so I didn't expect any less from this product. The packaging says it smells like "shea butter, macadamia oil and marshmallow" I don't know about you but the word 'marshmallow' swung it for me. I don't know how to describe the smell but it smells amazing. Trust me. I have good taste. On the packaging Soap and Glory asks "the most astonishing hand cream ever?" Yes, Soap and Glory, yes it is. 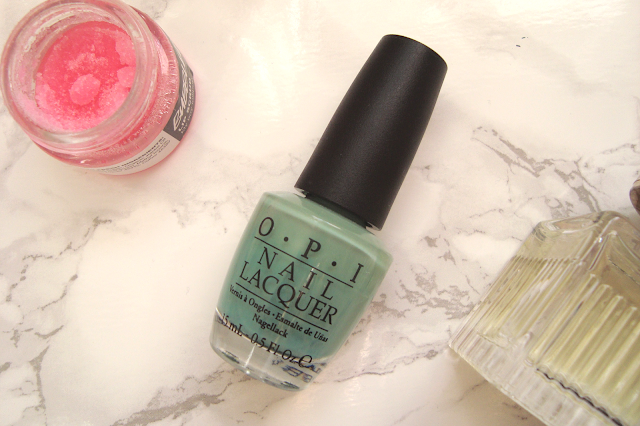 OPI's Nail Lacquer in Mermaids Tears is a lovely mint green which you can layer up to a darker green depending on how many layers you use. It's from the OPI Pirates of the Caribbean Collection which was first released in 2011 but it's still out and you can still buy it, you may need to have a little hunt for it first though. I only needed two coats of OPI's Nail Lacquer in Mermaids Tears to get fully opaque coloured nails but I added 3 just to make sure. It dried relatively quickly too which is good. I decided to pair Mermaids Tears up with the China Glaze Glitter Nail Lacquer in Material Girl, part of the China Glaze 3D Glitters Collection from 2011. Material Girl is an entirely pink based glitter nail varnish, crammed full of different sized particles of the pink sparkly stuff. I needed to use quite a few layers of Material Girl to completely cover the accent nails but once you manage it, it looks wonderful. It's one of those nail varnishes where you find yourself unable to keep your eyes away from your hands as it is so eye-catching. I used a top coat on top of my nails, not just because it seals it all in but because Material Girl feels a bit rough once you apply it and it dries. I know some people don't like the texture of glitter nail varnishes so if you buy this and you're not a fan of the feel of it, apply a thick top coat. If there's one thing I like more than wearing copious amounts of make-up is baking. And if there's one thing I like more than baking cakes is eating cakes. On Saturday I found myself on Instagram searching through the tag 'ombrecake' and thought "I want to do that" so I gave it a little go. To begin with I googled 'ombre cake recipe' but all the results I found were with American ingredients and with American measurings. I saw one recipe that I liked the sound of from Glorious Treats. I have to admit and say that I didn't have any plain flour so I used self-raising. I think this may be why my layers are a little flat as I think the self-raising flour and the baking powder counteracted each other. Either that or I didn't have enough mixture! When I make this again I will definitely try it with plain flour to see how much of a difference there is. When it comes to the colouring of the cakes, please try and resist the urge to buy normal food colouring. I've found that when using liquid colouring you need to use a lot of it to get a vibrant colour and the more of it you use, the more of an odd taste it gives off. Instead try and buy gel food colouring. You can buy this in most supermarkets now and it's fairly cheap too. The one I used for this recipe is one that I bought from ASDA for £1.98 and it was from the brand HOME2BAKE. (I bought the red one) If you're struggling to find some in the shops then these Sugarflair Gel Food Colourings from eBay are even better and come in a large variety of colours. 2. In a medium bowl, add the flour, the salt, and the baking powder. Stir with a fork and leave to one side. 3. In either a free-standing mixer or a handheld mixer, beat the eggs for 20 seconds. Add the sugar and beat on a medium speed for 30 seconds, then add the vanilla extract and the oil and beat until incorporated. You now have your cake mixture! Now onto the ombre. 3. Using a cocktail stick or the end of a spoon, scoop a little gel colouring out and colour the batter. Make sure you mix it in really well otherwise when you tip the batter into the tins you find you'll have swirls of colouring on the top of the cakes once they're baked. 4. Once you've coloured your cakes, you're ready to prepare your cake tins. I don't know anyone who has 4 of the same sized round cake tins, I know I don't! So you'll have to do it in stages. If you have two tins then that's great, if you only have one tin then that's okay, it will just take you a little longer. 5. Grease your tins then place the tin on top of greaseproof/baking paper and draw around it with a pen. Cut out then place into the bottom of the tin. Repeat if you can. 6. Pour the batter into the tin, level it out then put it in the oven (which should be pre-heated) for 12 minutes. Stick a skewer in, if nothing sticks to the skewer when you pull it out then it is ready. Repeat this until all of your layers are baked. Your cakes are baked! Now for the icing. Again, I used a recipe from Glorious Treats, this time the recipe I used was for American Buttercream Frosting. Like before I converted the measurings from cups to grams but halfway through the piping I found I ran out so I've changed the measurings slightly so hopefully you won't run out either. 1. In a free-standing mixer or using a handheld mixer, beat the butter into soft and smooth for 30 seconds on a slow speed. 2. Slowly add the icing sugar a little at a time. When it gets a little thick, add a few drops of milk to make it easier to mix. Add the vanilla extract and once you've added all of the icing sugar, beat for another minute or so until there are no lumps. 3. Place the darkest sponge on the bottom before putting a spoonful of icing on top. Using a palette knife or a knife, spread it all over the top of the cake. Repeat for each layer. 4. Once every layer is covered with icing, cover the rest of the cake with it, paying attention to the sides. Once you've finished this you should have one big, white cake. 5. Add a few drops of gel food colouring to the remaining icing and mix well with your mixer. EITHER: 6. Place your cake in the fridge for a little while to harden. This will make it easier for you if you want to just spread your coloured icing on. 7. Once it's set, spread on your icing using a palette knife, starting with the sides, working your way up. OR: 6. Place your icing in a piping bag with a open holed star nozzle. Pipe swirls all over the cake and where you have gaps, pipe little swirls. Repeat until you've covered your cake entirely. ADDITIONALLY: If you want your icing two tones like mine, once you've piped halfway with one colour, add a little more colouring to make a darker colour then repeat with the piping. This cake took me about 4 hours to make from start to finish but I think it was time well spent. It also tasted pretty good too. A couple of weeks ago I was in Boots with my sister when I saw this little bottle of nail varnish on the shelves. The name? 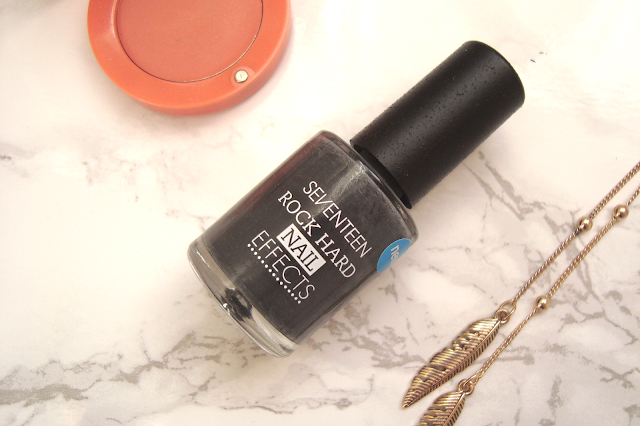 Seventeen Rock Hard Nail Effects Nail Varnish. This textured nail varnish instantly reminded me of the Nails Inc Concrete Effect Nail Varnishes but just a cheaper dupe. I know textured nail varnish is a bit of a one hit wonder - they are popular for a couple of weeks then everyone forgets all about them but they are a bit quirky and different and make a nice change. The Seventeen Rock Hard Nail Effects Nail Varnish applied really easily. The bottle suggests you apply two layers but I think one layer would do the job nicely. I applied two layers and watched in amazement as my nails turned into concrete. It's a bit odd at first, watching as your nails turned bumpy so they get a bit of getting used to. They dried really quickly which is good but I didn't want to apply a top coat in case it ruined the look which I regret slightly as they chipped within 2 hours! I found that despite minor chipping it lasted around 3 days on my nails without a top coat which I guess is quite good. When it comes to taking this nail varnish off you have to treat it like it's a glitter nail varnish, meaning it is a little cow to remove but like I said, it is a bit different and it makes a change to a normal nail varnish. A while ago I bought a few different products from Boots and I was in desperate need for a new mascara so I hastily picked this one up, Maybelline Great Lash Waterproof Mascara in Very Black. It was only when I got home that I realised I picked up the waterproof version rather than the normal mascara but I suppose a waterproof mascara is always handy! The wand is fairly small which has a downside and an upside. 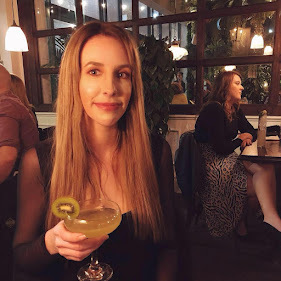 The upside is that you can apply the mascara to the short lashes by the inner eye and you can build up as much as you want to your eyelashes, the downside is that it will take you a while! As the wand is fairly small you would think that it would make application to the bottom lashes easier but it doesn't. 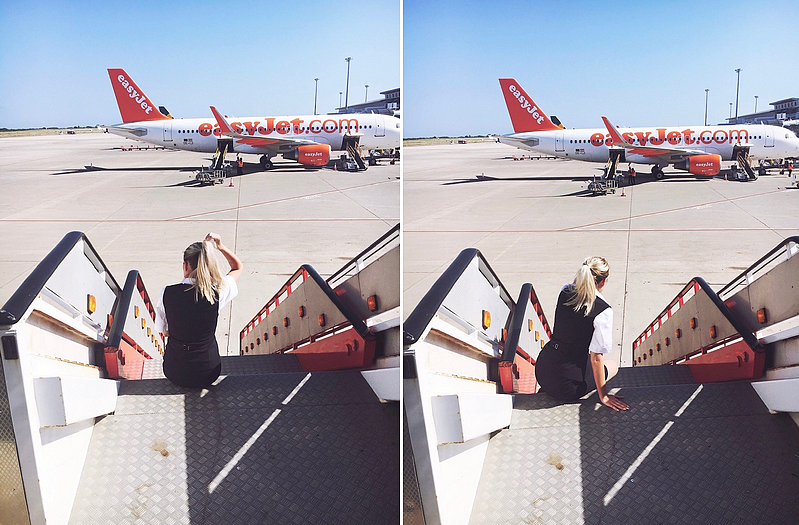 I found it really fiddly applying to the bottom lashes which you can see in the photos below. The mascara isn't wet at all which is nice, no transferring to the eyelids! I bought this in Very Back and it is just that, very black! I found that this mascara made my eyelashes appear much longer and fuller and lasted all day without crumbling off. It has a very odd smell to it, one which makes my dog want to lick the wand, but after a while you get used to it! Overall, it's not the best mascara I have ever used but I will definitely buy it again. Best of all? It's only £4.99 from Boots which you can buy in store or here.